VANCOUVER, BRITISH COLUMBIA--(Marketwire - Nov. 15, 2011) - Douglas Lake Minerals Inc. (the "Company" or "Douglas Lake") (OTCBB:DLKM) is pleased to announce that 57% of the first phase of the Magambazi drilling program has been completed on November 11, 2011 end of 19h00 shift. "Delineation of the potential gold bearing as well as related zones at our Magambazi East target is progressing according to plan," stated Dr. Reyno Scheepers, COO of Douglas Lake Minerals. "The commissioning of an additional core drill rig will significantly reduce our standing time and expedite the completion of the evaluation of the Magambazi East target." Magambazi East is one of two Company targets currently being drilled on our 800 square kilometer sized prospecting licenses in the Handeni district, Tanzania (Fig.1). Fig. 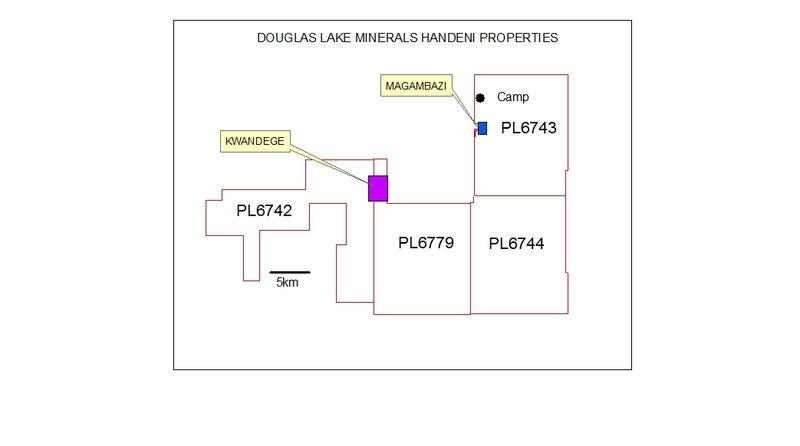 1: Douglas Lake Minerals Handeni properties outlined in red with the Magambazi (blue) and Kwandege (purple) target areas diagrammatically indicated. The Company has drilled 2852 meters of the planned 5000 meter (57%) diamond core drilling at Magambazi. Eleven (11) of the envisaged 25 holes are completed, hole 12 currently being drilled (Fig. 2). A total of 1518 samples from Magambazi have been submitted to SGS laboratories and 2097 samples to ALS laboratories (Mwanza, Republic of Tanzania) for gold (Au) assays. Fig.2: Drill-hole positions at the DLKM Magambazi East target. Holes for which gold assay results have been received are represented as red stars. Blue star represents the hole currently being drilled. Elevation high (H) and lows (L) are indicated as contours (grey) outlining Magambazi Hill. Green stippled lines are the projected garnet amphibolite gneiss as intersected in drill holes to date with a strike distance of approximately 340 meters. Two (2) holes (MZD_03 and MZD_04) were drilled on a chargeability anomaly to the northeast of the main mineralization zone outlined in green stippled lines (Fig. 2). The geological unit (garnet amphibolite gneiss) associated with possible high gold mineralization at Magambazi is similar to that found at Kwandege. Drill-hole data is represented in Table 1. Douglas Lake is currently in the process of evaluating and prioritizing drill positions surrounding Magambazi-East to try and extend the length of the currently defined 340 meter target zone. Several of these drill positions are considered to have high potential due to a combination of soil geochemical anomalies, high chargeability zones and surface outcrops of the geological units associated with gold mineralisation. Hole number MZD_12 is currently being drilled on the first of these targets. 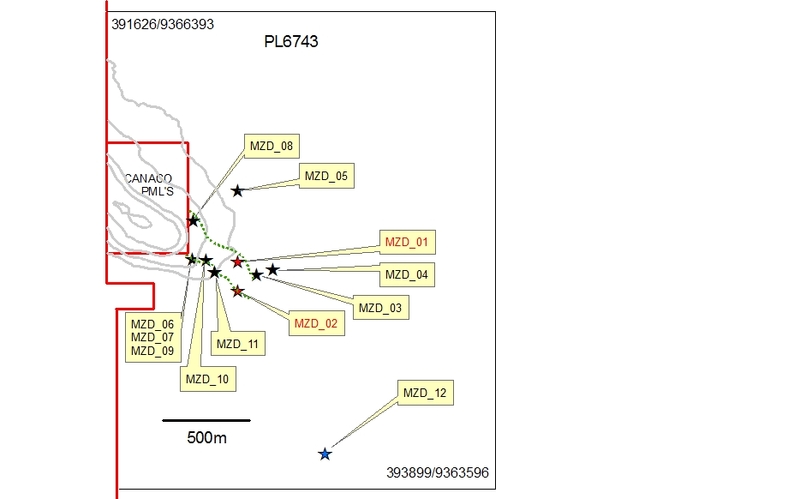 Following this phase the remainder of the available 5000 meter will be used to infill drill the main mineralization zone between MZD_01 and MZD_10 in order to better understand the concentration and distribution of gold mineralisation (Fig.2). Table 1: Summary of drilling progress at Magambazi indicating metres drilled and samples submitted for each hole.